This book is typical of Daniel Dennett's other offerings. It's extremely meaty, rich in metaphor and analogies, often deep and remarkably thought-provoking, linguistically clever, wide ranging to the point of being distractingly digressive and covers a remarkable swathe of intellectual ground, from computers to neurobiology, from word acquisition to elevator design, from computer bugs to biological viruses, from Charles Darwin to Alan Turing. That being said, it's hard to say what this book is really about since it's about so many different things. As another reviewer pointed out, Dennett's digressions can sometimes be distracting and it is difficult to see the central point in his argument. The book also doesn't seem to present a novel hypothesis per se. Its ostensible purpose is to describe the evolution of human minds and thinking and what makes them special. It succeeds in this endeavor to a large extent, but still doesn't end up really explaining key concepts like consciousness (which Dennett thinks is an illusion). The main device that Dennett uses for unraveling intelligence and minds is the concept of memes which was introduced by Richard Dawkins. According to Dennett, the co-evolution of genes and culture through memes is what makes human minds special. Again, gene-culture co-evolution is not a new concept, but Dennett explores it with verve and insight. 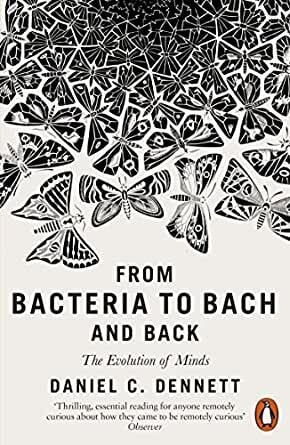 I think the main function of this book is to serve as a springboard for exploring some very clever analogies between software and biology and for appreciating the naturalistic evolution of human language and thinking. There are gems scattered throughout the text: for instance, the concept of "competence without comprehension" which is a version of Dawkins's "blind watchmaker" analogy, and the very revealing insight that simple things like nail cutters might be impossible to imagine arising through natural selection while complicated things like human minds can well be imagined evolving this way. There are also excellent discussions on how children acquire words and how these words then interact with genetics and culture to produce very human features of the brain like foresight, introspection and planning for the future. Some of this material constitutes an argument against intelligent design. The analogies are elegant and often clever and Dennett's play on words can be very subtle; for this reason several paragraphs may have to be read a few times to really grasp their essence. In this sense the book has to be savored and resampled like fine wine. In general then, I enjoyed the book but found it too digressive and slow-going in parts. On several occasions I found Dennett slipping into academic language, with the academic references and jargon to boot. Reading this volume requires patience and careful study, and this patience will often be rewarded. But it's not what you would call an introductory or popular treatment: if you are not familiar with standard popular works on evolution, language and psychology by writers like Richard Dawkins, Steven Pinker, Matt Ridley or Daniel Kahneman it would likely be pretty hard going. But as a sampling of scattered gems which reveal themselves through rumination and constant reflection, it's hard to find a writer as clever and insightful as Daniel Dennett. The Evolution of Minds is an attempt to frame how to understand the evolution of consciousness and the use of meme's in that process. It has much to offer for those interested in comprehension and what distinguishes competence from comprehension but its content comes with the burden of a cloudy narrative that meanders into personal disputes with other philosophers and a lack of organization and sequencing in much of the content. I am glad to have read the book but there were large sections which I felt added little with a high likelihood of confusion due to poor organization. The book is split into three parts and contains 15 chapters in total. The author starts with some of the philosophy of consciousness and brings up ideas of Cartesian dualism and dismisses at an early stage the existence of consciousness in other animals despite high competence. He separates out the ability of this self reflection, a mind's ability to reflect on its state of mind, from cleverness and frames the search for consciousness as the mechanism which allows for this elevated self reflection unique to our knowledge in humans. The author then spends time on things like what evolution really means which he frames as an inversion of reasoning. The term is supposed to describe how there are no reasons there is just natural selection which through mutation leads to fitness improving variations which then propagate with higher probability leading to outcomes which are beneficial for the species. This mechanism means there is no why things exist, there is just a differential replication mechanism that leads to improved outcomes on a species wide basis. The author calls this inversion of reason which I don't think is as clever as the author believes it to be. The author also spends time on competence and discusses results from various species make instinctual decisions on their immediate surroundings as well as the tools at hand. There is decent up to date experimental results in this section so the book is very much up to date on recent animal studies. The author moves in to the core of the book which is really how comprehension has evolved and starts with some results information theory. The author gets into philosophical issues like the difference between semantic meaning and bits in information theory. There is nothing wrong with these sections but it strikes me that the author is far from an expert on the more mathematical parts of the book he tries to describe intuitively. The author then gets into how he sees the "space" that fitness functions can occupy. The Darwinian starting point is a bottom up evolutionary search process (competence with comprehension) and the opposite corner of the cube of possibilities (you'll see the diagram if you buy this) is top down elegantly constructed solutions like the works of Picasso and other intelligently designed systems. He sees humans as uniquely able to move in a bigger fitness space by using consciousness to make much more progress in adaptation than would be possible through pure bottoms up Darwinian evolution in competence space. This description is pretty intuitive and I felt it was a good way to describe how humanity has been able to speed up its understanding of its environment at a speed incomparable to an evolutionary process. Now the main arguments of the author are that this evolution of consciousness that has allowed the speeding up of our self improvement is due to memes (items associated with our culture) and most importantly the subset of language within the space of memes. The author describes the process in which meme's themselves follow a Darwinian process in which good cultural ideas propagate and poor ones die, so for example if kayak design is based off copying the kayaks which come back, a good kayak is due to its success in surviving a journey rather than its top down well designed construction which took into account multiple design nuances. The one real argument that I remember strongly is that the improvement and refinement of our language allows us to organize and gather more and more information that allows us to make progress within generations rather than over a long history of the species as we transmit our lessons and knowledge via our language and its codification. The author then goes on to discuss how our knowledge of the evolution of language is effectively non-existent and it is probably the case that our own consciousness evolved with the evolution of language rather than them being independent. The author likens the mind of ancient people to that of children just at the beginning of their path to learn language and communication skills. It is a non-trivial idea which is worthy of deep reflection. This theory is not the authors but he is a strong and clear advocate of it and the idea is somewhat new to me so I am glad to have read the authors ideas surrounding the subject. The author ends by describing how consciousness can be an illusion, he uses some optical illusion mechanisms which are weak along with some other examples which were unconvincing to me. The main point though again is worth thinking about which is that our consciousness is of our own construction using our accumulated memes and so reality is not our perception of events. We cant control our livers so who's to say that we can control our consciousness. Our brains are self-referential dynamical systems so there are ways where we influence ourselves but the idea of free will etc are challenging, complex and hard to define. 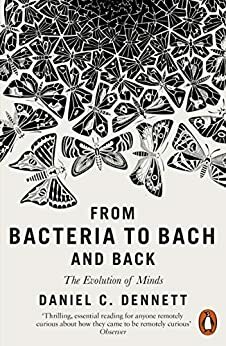 From Bacteria to Bach and Back: The Evolution of Minds is an attempt to give a theory of how consciousness evolved and what its architecture has used. The authors conclusion is mainly that our memes create our consciousness and they allow a rich structure that has evolved consciousness. This benefit has allowed us to move from a bottoms up blind watch maker optimization to a self referencing agent who can move more quickly in fitness space. Its interesting in its conceptual foundations. Unfortunately the writing can be off point at times and the sequencing of ideas can be weak. There are multiple points where the author brings up some dispute he has from 20-30 years ago which add nothing and the author is just convincing himself. So there are parts which can be tedious and low value but the core idea I am glad to have read. Worth reading but I think the editing could be improved upon.